MEDFORD, Ore. – A man who is police said has ties to nine separate thefts is now behind bars. 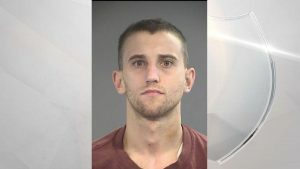 On August 29, the Medford Police Department said they were trying to track down 28-year-old Jordan Ronald Lundgren after he was spotted with stolen property in the 2000 block of Kings Highway. He fled the area but left behind a vehicle full of stolen items. On the morning of September 3, MPD announced Lundgren was arrested thanks to a tip that he was at Four Corners Market. Lundgren was lodged in the Jackson County Jail on three charges of burglary, four charges of theft and one charge of unlawful entry into a motor vehicle.